You have not seen a new blog post from me in several weeks but it is for good reason. Just recently, Ancestry.com released newly digitized records that include U.S. wills and probate records. This is truly a groundbreaker, especially for North Carolina researchers, and especially for Granville County researchers. Previously, some wills from Granville County were accessible for free at familysearch.org, but it was a very limited collection and did not include records for most years. 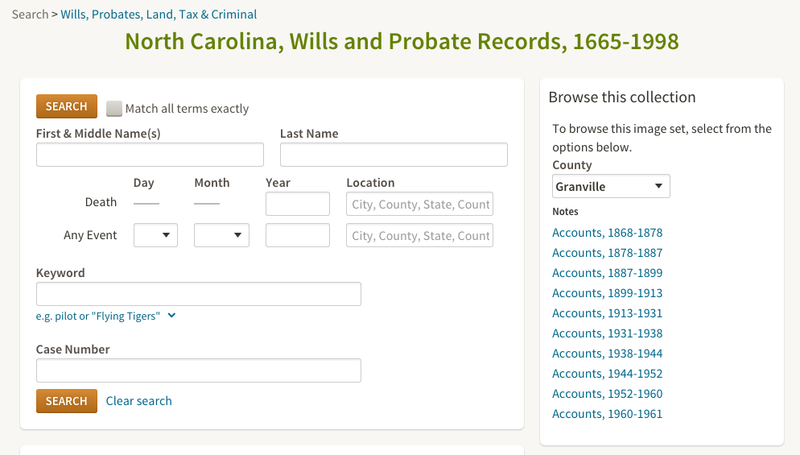 Here is a direct link to Ancestry’s North Carolina, Wills and Probate Records, 1665-1998. The new North Carolina Wills and Probate Records collection is what has been keeping me busy over the last several weeks. The records for Granville County are quite revealing. And it gets better! Not only does this new collection include estate records and wills for Granville County, it also includes apprenticeship records and other court documents. Apprenticeship records are created when children are “bound out” by the court to a non-parent. The children become “indentured servants” where they are required to serve a specific number of years and learn a trade. Children from the Native community in Granville where frequently “bound out” and so we are quite overrepresented in these records. However…..and this is what is taking me so long to get through these records….this new collection is not indexed properly and some parts are not indexed at all. The wills and estate records are indexed but Ancestry did a poor job with the index. Frequent problems are that the records from separate individuals are mixed in together and some names are grossly misspelled. The apprenticeship records are not indexed at all, and there are thousands of pages. So I have created a makeshift index of the apprenticeship records pertaining to children from the Native community. The exciting news is that I have found a wealth of information in this new collection and it is helping me clarify and correct genealogical relationships. So my next several blog posts will certainly be about these discoveries. I am really looking forward to sharing this new information with you, so stay tuned.